(CNSNews.com) - Annual growth in the real Gross Domestic Product of the United States has not exceeded 2.7 percent for a record eleven straight years, according to data published by the Bureau of Economic Analysis. In the fourth quarter of 2016, according to the BEA, real gross domestic product grew at an annual rate of 2.1 percent. But for the full year of 2016, it grew by only 1.6 percent. The BEA’s “advance” estimate for the first quarter of 2017 showed growth in real GDP slowing to an annual rate of 0.7 percent. The 1.6 percent growth in real GDP for 2016 is the slowest annual economic growth the United States has seen since 2011, when real GDP also grew by 1.6 percent. The last time real GDP grew by 3.0 percent or more was 2005, when it grew by 3.3 percent. In the last eleven full years—from 2006 through 2016—the strongest annual growth in real GDP was the 2.7 percent recorded in 2006. In the last ten full years--from 2007 through 2016--the strongest annual growth in real GDP was the 2.6 percent achieved in 2015. The Bureau of Economic Analysis has calculated annual growth in real GDP going back to1930. 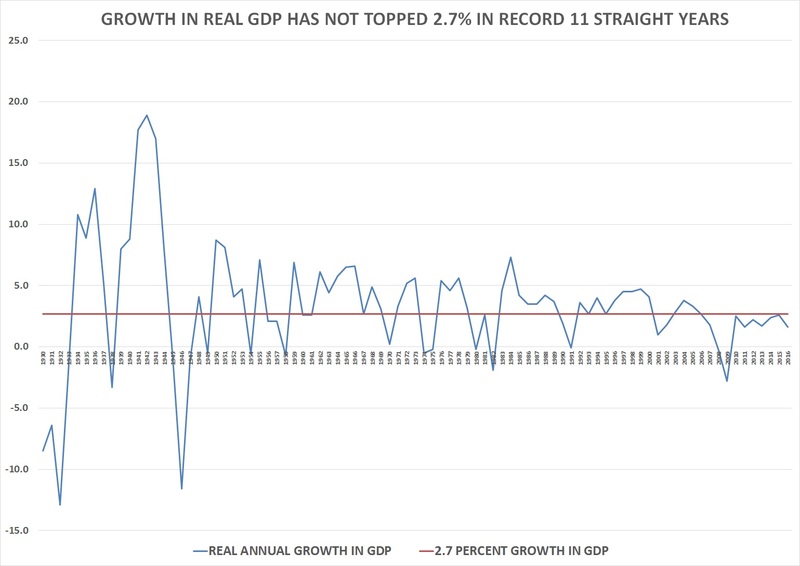 In the era since then, the second longest stretch when annual growth in real GDP did not exceed 2.7 percent was the four-year stretch from 1930 through 1933. In those years, real GDP declined by 8.5 percent, 6.4 percent, 12.9 percent and 1.3 percent. But in 1934, the U.S. economy bounced back, growing by 10.8 percent, followed by 8.9 percent growth in 1935, 12.9 percent growth in 1936, and 5.1 percent growth in 1937. In 1938, it declined by 3.3 percent. In the 87 years from 1930 through 2016, the longest stretch of years in which the annual growth in real GDP never dropped as low as 2.7 percent was the seven years from 1983 through 1989. During that seven-year span, the slowest annual growth in real GDP was 3.5 percent—a level it hit in both 1986 and 1987. President Ronald Reagan took office in January 1981 and left in January 1989. In the eight years of 2009 through 2016, when President Barack Obama was in office, real GDP never grew by as much as 2.7 percent. In that era, the highest level of annual growth in real GDP was 2.6 percent in 2015. By contrast, in the eight years from 1993 through 2000, when President Bill Clinton was in office, the annual growth in real GDP dropped as low as 2.7 percent twice (in 1993 and 1995), but never dropped below that level.